Glamorgan have confirmed the appointment of Matthew Mott as their new coach on a three-year deal. Mott, 37, is currently head coach of New South Wales, who won both the Sheffield Shield and Twenty20 competition during his reign. "After spending six years coaching in Australia, I believe that now is the right time for me to further my coaching career," said Mott. "I look forward to working with the players and the coaching team." Glamorgan's new managing director of cricket Colin Metson believes that Mott has the necessary track record of success the Welsh county needs. "We are delighted to have secured Matthew Mott as our new first XI coach," he said. "He has a proven track record of success and I look forward to working with him when he arrives in March, following the completion of his coaching commitments in Australia. "Our new captain, Alviro Petersen, has previously spoken with Matthew and is looking forward to working in partnership with him to deliver success on the playing field." He was interviewed for the New Zealand job two years ago but opted to stay in Sydney. Mott was also linked with coaching new Indian Premier League side Kochi. He has previous IPL experience as assistant coach at Kolkata Knight Riders under John Buchanan for two seasons, before a change of backroom staff following disappointing performances. Mott appeared 66 times for Queensland and Victoria as a top-order batsman during his playing career. 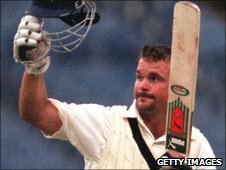 He will come in to Glamorgan under Metson, whose elevation to his new post saw cricket director Matthew Maynard hand in his resignation. Former captain Jamie Dalrymple and president Peter Walker also quit the Welsh club. Dalrymple went after being informed that South Africa opener Alviro Petersen had been asked to lead the team next season. Petersen met with the Glamorgan squad for the first time this week, flying in after the culmination of the drawn Test series between South Africa and India, in which he averaged 34 runs.